We're preparing clinical outreach educators to meet clinicians and ignite behavior change. Our 2-day session training course covers all program materials, breakfast and lunch on both days, and a networking dinner on the evening of Day 1. This training course offered on July 18+19, 2019 will be focused on opioids. Participants are responsible for funding their own lodging and transportation. Our course is held at Metro Meeting Centers at 101 Federal Street, Downtown Boston. Upon registration confirmation, we hold a reservation for a room for each participant at the nearby Club Quarters Downtown Boston. ​Please direct any further inquiry to NaRCAD@partners.org. ​networking, expert panels, modeling, & more. Hundreds of trainees have completed our 2-day course ready to visit practices, build trusting relationships with front-line clinicians, ​skillfully share best evidence, and successfully implement effective health interventions. 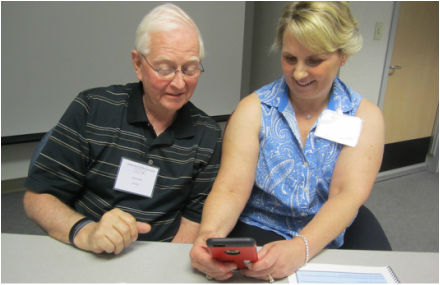 A trainee educates a clinician on the use of an app-based cardiovascular risk calculator. A trainee and facilitator work 1:1 to review the structure of a visit. Interested in an on-site training for your group, or a refresher course?